3 major soil types : -soils with rolled pebbles -stony terraces with sand and gravel sub-soils -clay soils formed from the limestone mother rock. Virtually total de-stemming, pumping over twice a day. Vatting time : 2 to 3 weeks in concrete vats. Matured for 18 monthsin vats and "foudres" (15%). Domaine de Vieux Lazaret is owned by the family Quiot, who has lived in the town of Châteauneuf du Pape for about 300 years. All the best parcels are - down to 1m depth - covered in potato-sized, round rocks that are terrible to work in. A shovel or chop does not last long in those fields. But all these round, bright stones are of great importance to the grapes. During the day, they reflect the sun's rays so that the grapes also get light from below, and at night they act like warmths that give off all the heat they have sucked in today's race. One of the secrets of the production of red Chateauneuf-du-Pape is a very long fermentation where shells and grains are in contact with the must for up to 21 days. Twice a day, the aunt is pumped over the shells to extract as many flavors, color and tannins as possible. The temperature during fermentation is kept at 30 degrees, which is checked automatically. After the fermentation, the wine is tested by the authorities. The last flavor component is derived from farm storage for several months on brand new oak barrels from central France. All the wines are bottled on the special bottles of flax. These bottles may only be used by wine-growers in Chateauneuf-du-Pape, who tap their wines on the property. Chateauneuf-du-Pape Rouge has a deep crimson color and an aroma of mature dark berries and spices. The taste is soft and persistent with good filling. Vintage 2014 DANEMARK: une robe d'un rouge carmin profond et un arôme de baies noires mûres et d'épices. Le vin est souple et persistant avec une bonne ampleur en bouche. Vintage 2013: Brilliant ruby-red. Lively, spice-tinged red fruit and garrigue on the fragrant nose and a spicy element building in the glass. Gently sweet and seamless on the palate, offering fresh raspberry and spicecake flavors that flesh out with air. Subtle tannins give shape to a nervy, incisive and persistent finish that leaves a peppery note behind. SWEDEN: vintage 2012 - Lazaret is French for quarantine and the property has philanthropic tradition. But the name can equally stand for the wine should be stored for future enjoyment. The smell is massively complex and extremely origin typical marked by alcohol and layers of fruit flavors and herbs. The taste is meaty and has a long, pleasurable length. 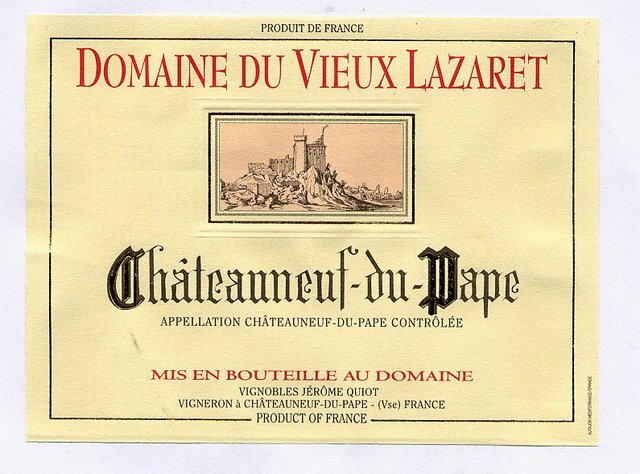 Vintage 2013: USA The 2013 Chateauneuf du Pape Domaine du Vieux Lazaret should be a good, yet not ground-breaking effort. Dark fruits, leather, licorice and herbal notes ail give way to a medium-bodied, traditionally styled effort that’s best drunk over the coming 5-7 years. VINTAGE 2012 - CANADA With a traditional feel, this wonderfully complex, fleshy and slightly lactic southern Rhone blend offers a great deal of bang for your buck. A deal at less than twice the price of a standard format bottle. Generous and with traditional charm from the reliable and well-established Chateau Lazaret. A compelling, slightly lactic note offers a dimension of complexity. The palate is a little less full and fleshy, in an appealing way, than the norm but exhibits good complexity and balance. Barrique notes of lavender and licorice linger on the very long finish. VINTAGE 2012 - CANADA: Still very youthful and closed (tasted from magnum), I like the succulence and juiciness, the roasted dark fruit character and the spice here in Vieux Lazaret's 2012 Châteauneuf. Ultimately, the density and concentration are merely good, not exceptional, but this remains balanced and highly drinkable. I'd say another 2-3 years should see this fully resolve. This is an engaging and complex Chateauneuf at a decent price compared to others from this famous region. It has a generous sweet nose of plums, violets, earth and licorice, with hints of graphite and anise that really bring it home to the southern Rhone. It's medium-full bodied, fairly dense and warm with considerable alcohol, but also some sourness. The length is excellent to outstanding. Some minerality on the finish. Tasted December 2012.
millésime 2010: The Vieux Lazaret 2010 Chateauneuf du Pape exhibits slightly fresher acids as well as a more delineated style. Notes of truffles, blackberries, cassis and kirsch are present in this 2010 along with sweet tannin, excellent vibrancy and a heady finish. It should drink well for a decade or more.